Each style of the Southern Steel Pipe Tobacco brand consists of bold flavors with a smooth blend made with versatile southern high quality tobacco ingredients. Southern Steel Pipe Tobacco combines tradition, value and modern sophistication with all the characteristics of the South, packaged up at a reasonably-priced durable, re-sealable foil pouch. Each Southern Steel Pipe Tobacco offered below at our online pipe tobacco shop is guaranteed to be fresh, ready to be shipped with a quality tobacco that delivers a superior experience. 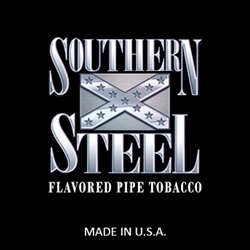 Southern Steel Pipe Tobacco is American-made distributed nationwide by SX Brands in Richmond, VA USA. Each pouch of Southern Steel Pipe Tobacco are available at our online tobacco store in a variety of flavors: Maximum Menthol, Maximum, Mellow and Wild Cherry. Every day smokers are switching to this premium tobacco not just for the great inexpensive prices, but for the quality and superb taste. Southern Steel Pipe Tobacco offers an excellent choice for your money saving needs. Smokers Discounts has made it easy and affordable to buy pipe tobacco online. Call us for more details!